Victims of spinal cord injuries are thrust into new ways of living instantly, right at the moment their accident happens. But family members and friends also have to adjust to a different way of life in their new roles as caretakers. Confusion, anger and sadness are all normal parts of the reaction process after someone you love is injured. But despite all of these conflicting emotions, you have to find the strength to help your loved one adjust to a new life after their injury. When you're unsure of what your next step should be, call us on behalf of your injured family member. We can help you navigate the hard questions and give you some peace of mind along the way. At Edgar Snyder & Associates, we want families to know that we're ready to help them take on the new challenges of their daily lives. Your loved one might be in pain or struggling to adjust to life in a wheelchair, but where does this leave you? You may feel helpless but there is something you can do. Call us for help at 1-866-943-3427. 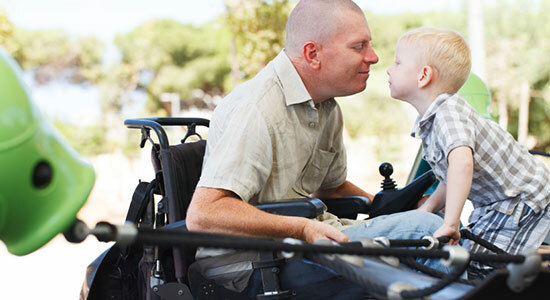 We understand the major stress of the situation on your entire family, and below is some helpful information for adjusting to your new life with a loved one suffering a spinal cord injury. In the days and weeks following a spinal cord injury, physicians need to make sure the victim is as stable as possible before leaving the hospital. Diagnosing the severity of the injury is important and helps paint a clear picture about the future life of the victim. After this process is through and your loved one is ready to leave the hospital, they will typically enter a rehabilitation program. Rehab entails physical therapy, occupational therapy and counseling to help your loved one adjust to their new life — whether that means they are now completely wheelchair-bound and can't move their legs, or that they struggle to even breathe on their own. The team of therapists at the rehabilitation center are there to help you all adjust as a family. They are great resources for all of your questions and concerns, so make sure to ask anything you want to know. Coming home from rehab can be a very daunting process, both for the victim and the family members taking on the role of caregiver. Make sure to talk to your other family members to decide together how the role of caregiver will be assigned. It might be that one family member handles helping your loved one get ready in the morning, another family member helps with getting meals together and assisting with mobility challenges. These are all things that should be openly discussed to help make the transition as smooth as it can be. If you find that you, or other family members, may not be able to handle all that comes with taking on this new role, don't be discouraged. Talk to the rehab team about other options such as an assisted-living facility or hiring in-home help. They are there to help you, and if you decide to be the primary caregiver, the rehab team can teach you what to do to help your loved one. They can train you on exercises, moving your loved one in and out of a wheelchair, getting dressed and other daily tasks. For your loved one, dealing with limited independence and having to adjust to a brand new life can be incredibly disheartening. They're going to experience a wide range of emotions that you may not be prepared for, and they may have to learn the "basics" like brushing their teeth or eating a meal all over again. The feelings they express may be hard for you and other family members to fully understand, and many spinal cord injury victims find some solace in support groups. Withdrawal from family and friends due to feelings of dependency. An injury victim may feel frustrated at losing any of their independence, even through something as small as needing help reaching a shelf that is too high. Victims may think they've become burdens on their family members and friends. Your loved one may talk as if life would be so much easier without them causing so much fuss and trouble. Your loved one may have feelings of anger and isolation. They may struggle with self-esteem and body image issues, and also fear abandonment from everyone they love in their life. Physical changes can cause embarrassment or shame as your loved one's body transforms after the accident. All of these emotional and behavioral changes can be taxing on family members and the injury victim. Keep communication lines open and look into support groups, both for the victim and for family members. Coping with a spinal cord injury is not an easy thing, and having a group of people who can understand what you're going through has been found to be extremely helpful. When you bought your home, you were probably not thinking about the challenges that narrow hallways or steps could cause for anyone. But now that you have a loved one who may be getting around solely by wheelchair, crutches, walker or a scooter, your home layout may need to have another look. Room for a Wheelchair: If your loved one is getting around via wheelchair, height and width of hallways, doorways and other spaces are going to be a concern. You may need to build a ramp into the entryway of your home, as well as figuring out the best ways to handle hallway and door widths, countertops, sinks and faucets, light switches, etc. Tools for Dressing, Grooming & Eating: If your loved one is able to have partial mobility of their hands or feet, they can gain some independence by having certain tools to help themselves get dressed, groomed and fed. Velcro fasteners for clothing or shoes can be helpful. Having loops in clothing to help them get dressed and undressed, as well as special handles on toothbrushes, razors and hairbrushes may be necessary. Special handles on cutlery, plates and cups can help in the kitchen. If your loved one cooks, a shorter stove could be installed. Other Adaptive Equipment: Tools that can help an injury victim pick up faraway objects or small objects, holders for telephones, pens and pencils, plus devices to help turn on electric appliances are all ways for your loved one to gain independence around the home. If you're struggling to figure out how to adapt your home, or wondering what exactly would be best for your loved one, talk to your rehab team. They can help you pick a plan of action to stick with, and give you great suggestions for how best to adapt your home for your loved one. Being the primary caregiver for a family member with a spinal cord injury can be extremely difficult. You're going to have good days and bad days, just like your loved one will. Enlist the help of family and friends to ease the hardship. Taking care of your own health is also important while you're trying to ensure your loved one is thriving. Staying strong and healthy should be a major priority. Everyone in a family deals with a situation like this in different ways. Keep communication open so everyone is on the same page when it comes to patient care and adjusting home life. If you need other people to talk to, support groups are great for providing comfort and understanding in a time that seems confusing and impossible. It's also a good idea to take some time for yourself. You can't do everything and be everything to all people, even though it seems like you're having to juggle everything on your own. Give yourself a break every once in a while to get out of the house, run errands, see friends and maintain a life for yourself too. The daily challenges that come with caring for a loved one who has suffered a spinal cord injury are extensive and difficult. At Edgar Snyder & Associates, we know your family is going through so much. While you focus on your loved one's recovery, let us focus on your case. We'll take care of the legal hassles and can help you navigate the health insurance system to ensure you're able to get the best care possible. You'll need money for medical bills, lost work time, and pain and suffering. You'll also need special adaptive equipment, changes to your home, your vehicle and more. We need to start our investigation as soon as possible before critical evidence disappears. If you, or a loved one, have suffered a spinal cord injury, contact our law firm today. We provide a free legal consultation. Just call 1-866-943-3427, or fill out the form at the top right of this page to get started. Source: “Living With a Spinal Cord Injury.” eMedicine Health. May 28, 2014. Source: “Spinal Cord Injury.” National Caregivers Library. May 28, 2014. Source: “Caregivers.” The National Spinal Cord Injury Association. May 28, 2014. Source: “Family and Spinal Cord Injury.” Rutgers University. May 28, 2014.